Plans for a new national TV network could be delayed – or scrapped | What Hi-Fi? 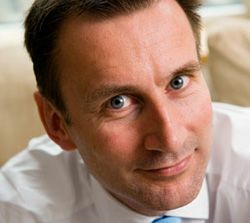 Culture secretary Jeremy Hunt's plan for a new national TV network, a key part of his proposal for a new generation of local television services, may be delayed or even scrapped, according to MediaGuardian. Despite more than 50 expressions of interest received by the Department for Culture, Media and Sport to run the new network, The Guardian says it is now likely to be delayed until after the new local TV services are launched, or abandoned altogether. Licensing of a new network to provide a national 'spine' for the local TV services was due to begin next month, to be followed by the issuing of local licences in 2012. Would-be operators are currently awaiting Government propsals for a formal biding process due to be published in June. But the scale of difficulty posed by legislating to force Freeview, Sky and Virgin to make channel slot 106 available on their electronic programme guides (EPG) for the new network, along with the cost of guaranteeing the necessary national spectrum, have apparently led to a major change in thinking.